We stood near the top of a difficult set of rapids and watched as the paddle floated down on the fast-moving water. We had just spent the past hour and more tracking our canoe maybe a hundred meters up these rapids. Now within ten seconds the paddle had almost covered the same distance back down. My brother was upset; it was his Auggie Lolk paddle, one of the two that we had bought from the paddle maker himself back in 1985 on a visit to his shop in Coldwater, Ontario. It had been on all our canoe trips since then. And now it was gone. And so, as the saying goes – we were up Petawa Creek without a paddle. Still in the canoe were the two bent-shafts that we use for lake travel and the other Lolk paddle. Without a doubt, most canoe trippers will know that awful feeling of realizing that something has been left behind – a life jacket, a Nalgene bottle, a fishing rod, a camera. However, this one hurt extra because we got to watch a cherished piece of gear float away – and we had to decide that this was how it was going to be. Damn! Petawa Creek is an 11.5 kilometer stretch of water that flows north out of Auger Lake into Petawanga Lake, which is itself a part of the 982 kilometer-long Albany River system. Not far up river (i.e.west) from Petawanga Lake is Miminiska Lake and a Wilderness North lodge, complete with its own landing strip. Just downriver from the Lake and up the Eabamet River is the Anishinaabe (Ojibwe) community of Eabametoong/Fort Hope, which was originally established as a fur trading post by the Hudson’s Bay Company in 1890. Why would anyone go up Petawa Creek? Now we were headed back south with a planned take out on the banks of the Pikitigushi River near a logging road. From there Annette Elliot of Mattice Lake Outfitters would transport us back to their base camp on Mattice Lake about eight kilometers south of Armstrong Station. To get there the first order of business was dealing with the “up the creek” experience that Petawa Creek would provide! The creek represents an alternative – and much shorter – way of getting from the Albany River to the upper Attwood River system at Hurst Lake and from there to the Ogoki River system via the Witchwood River. All told, it is about 30 kilometers from Petawanga Lake to the bottom of Hurst Lake via Petawa Creek. The wild card was the 11.5 km Petawa Creek section. The only on-line account of canoe trippers using the creek is the one that Chuck Ryan posted in 2009. It can be accessed here. It is unlikely that anyone else has gone up since then. The word “nightmare” comes to mind to describe the experience that Ryan and his bow paddler Dave Phillips had during the fourteen hours or so they spent going up Petawa Creek. Even though it was late August they had to deal with very high water conditions. There is another way to get to Hurst Lake but it involves paddling down the Albany from Petawanga Lake to the mouth of the Attwood River at the top of Gowie Bay and then back upriver on the Attwood to Hurst Lake. Total distance is 95 kilometers and it involves going up swifts and rapids at various points on the Attwood. This route would require four days of paddling, while the Petawa Creek “express” route would take us maybe a day and a half. In the end, we thought we’d give Petawa Creek a shot. On the one hand, we were hoping for (that should probably read expecting) better conditions that those faced by Ryan and Phillips. We also knew that Phil Cotton and the Wabakimi Project crew had been in the neighbourhood the year before and had worked on the portage trails at each end of the creek. Because of time constraints, they had to leave exploring the rest of the creek for another year. Part of our motivation was to record as meticulously as possible the swifts and rapids that we encountered as we went up so we could add to the Wabakimi Project’s Petawa Creek reconnaissance file. In my shirt pocket I had a voice recorder and my slim Canon Elph p & s camera to capture key points of our “up the creek” experience. Also useful for data were the every-ten-minute tracks created by our SPOT Connect. 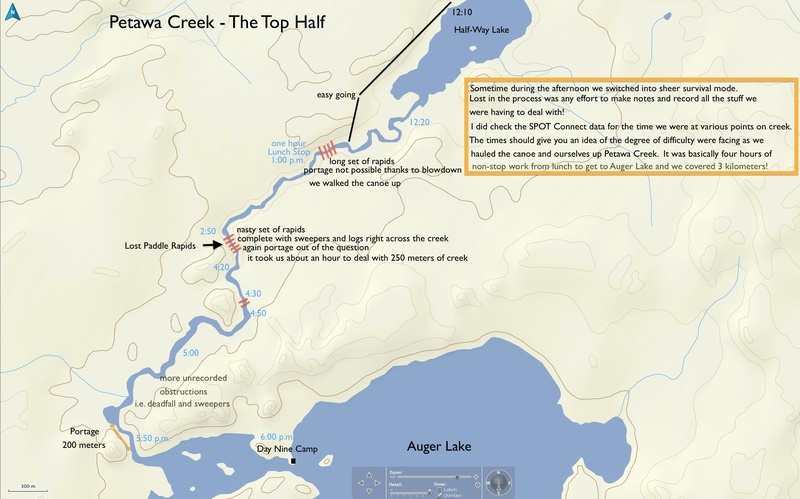 The creek is divided into two parts – the lower part up to what we called Half-Way Lake and then the upper part to Auger Lake itself. From our campsite on Petawanga lake we approached the mouth of the creek at about 9:00 a.m. and were soon in portage mode. On creek right (our left as we were going up the creek) just below the last bit of rapids we spotted the take-out point. From information that Phil Cotton had sent us, we knew that this was the start of a 400-meter portage which had been worked on just the previous summer. The trail would prove to be in good shape with just a bit of blowdown blocking passage in a couple of places. We trimmed what we needed to and moved on. The map below presents a fairly accurate picture of what we were faced with that morning – lots of swifts and the occasional set of rapids that we essentially walked up. While not easy, the challenges later presented by the top half of the creek made the morning seem like it was. I was occasionally in water up to my waist and Max was sitting mostly dry in the stern but that would change! It took us about three hours to do the 5 kilometers to Half-Way Lake. We continued on past Half-Way Lake up a meandering section that was easy to paddle. Then we were below the nastiest set of rapids we had yet faced this day. We thought we saw a take out point and went over to check. The “trail” quickly ended. What we were looking at was a total boreal jungle mess of deadfall and blowdown. We stumbled forward for a bit and realized that there was only one way up – and it wasn’t on land. The shoreline was such that tracking would basically involve walking up the creek itself instead of moving from rock to rock on the side. The current was noticeably faster than it had been in the morning and made our ascent a challenge but by 1:00 we were at the top of this set of rapids. We took a lunch break on the bank of the creek with what would be the day’s last bits of sunshine and pushed on about an hour later. It would take us another four hours to go up the remaining three kilometers of creek while enjoying some late afternoon showers. The map above indicates some of the difficulties we faced – but not all. Around 3:00 the effort to record the gps locations of swifts, rapids, and deadfall on the river was forgotten. There would be no more voice recordings until the next morning! I was, however, still taking pictures of the obstacles we were dealing with. This was around the time that we watched Max’s paddle slip down the rapids. From then on we focussed our energy entirely on getting up, over and sometimes through the wall of deadfall that blocked our progress. Part of our pre-trip planning had us talking about how to haul the canoe – the barely one-year-old kevlar/carbon! – over the odd sweeper or beaver dam. We did have our trusty Sven saw but we also came prepared with something new. It was a plastic snow sled – nicknamed the magic carpet – that Max had lying around. After eight days of hauling it with us – and using it as the door mat for the tent! – we started to put it to its intended use! Even though the dead fall was most often wet, the plastic made a difference. It saved the canoe from many a scratch on the side and bottom as we dragged it over stuff that could not be avoided. I got a great sequence of shots – before, during, and after – as we literally sawed our way through one of the last creek-wide walls of deadfall and accumulated driftwood that stretched across a set of rapids. I was looking forward to inserting the pix into the post right about here to get across the nature of the challenges Petawa Creek presents to the next passers-through. So Where Are The Pictures? Sometime after our last major obstacle at 4:00 p.m. I reached into my shirt pocket for my camera. The side entry zipper was half down; inside was the voice recorder – but no camera. It had popped out of the pocket without me noticing. Who puts pocket enclosures on the side anyway! I vaguely remember hearing a plopping sound and wondered what it was but dismissed it. As I noted elsewhere, the moment of realization was for me the most depressing moment of the trip. All of the daytime photos – maybe 250 in all – taken since Rockcliff Lake on the Misehkow eight days before – all the brief little videos to illustrate this or that point that I knew I would be writing about in the trip report – gone. Hours later I still couldn’t believe it and more than once Max looked my way thinking I was losing it as I cursed the Fates for exacting this cruel price of passage! First his paddle and now all those pix. Just before 6:00 p.m. we got to the top of the creek and the portage on creek left that would finally take us into Auger Lake. We headed for the campsite which the Wabakimi Project folks had created in the summer of 2012 while they were working on the portage that we had just come over. (See the above map for locations.) 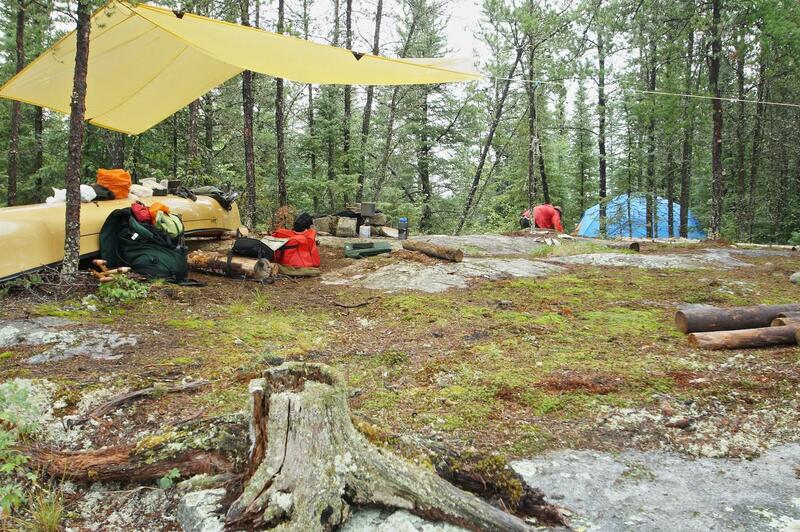 As the tent was going up, the rain started coming down – and would continue to do so for the next day and a half. We would end up spending a rain day at Auger Lake before moving on. It gave us a chance to lick our wounds! We are counting on next year’s canoe trippers to add to the file folder of information on the swifts, rapids, and other challenges that Petawa Creek holds. Who knows? Maybe we’ll do it again – but this time goin’ down! Maybe we shouldn’t think of that paddle as lost – it just hasn’t been found yet. Give us a shout when you pick it up! This entry was posted in wilderness canoe tripping and tagged Albany River to Attwood River, canoe adventure, going up Petawa Creek, Petawa Creek, Petawanga Lake to Auger lake, Wabakimi canoe route. Bookmark the permalink. 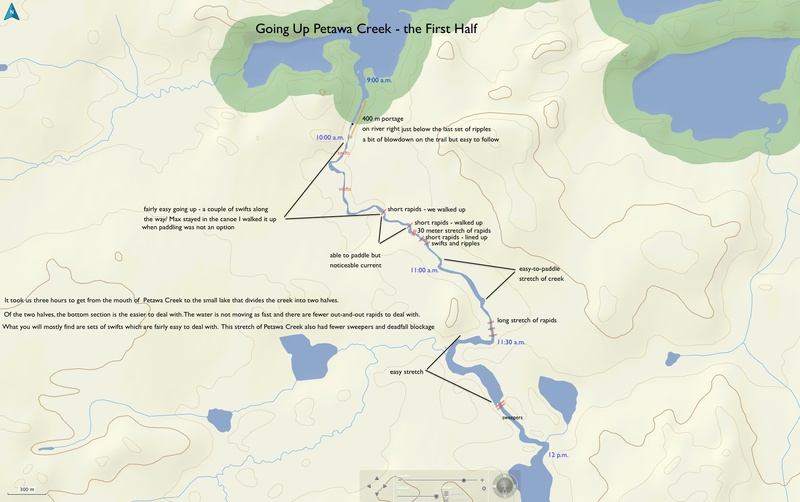 I was part or The Wabakimi Project group that started the Petawa Creek portage from the bottom of the creek on Lake Petawanga (the top if looking at the map). Congrats on getting through without a chain-saw. I hope there was enough firewood left for you at your Day Eight Camp. We worked on those piles for 7 hours on a windbound day. Ken, we sure appreciated the work you guys did -i.e.the two portages and the campsites at each end. I can’t even begin to imagine how much work it would take to cut some portage trails around the worst of the creek. Yes, you certainly left lots of firewood! I don’t think too many paddlers had camped there between the time you were there and we were. Great trip report . I have been up there with the wabakimi project . Just about cried when I read u lost all ur pics …. And ur beloved paddle !!! Visited Phil today and he just raved about ur great trip report ! Keep on tripping !!! Anon – glad you enjoyed it. My going on about the camera was a fine whine, wasn’t it! Keep on tripping indeed – you too! I can sympathize with the feelings of remorse over the lost camera. I experienced a similar fate on the Gull River, knocking a video camera off the bow in a rapid. It contained a days worth of video documentation that islikelynto never be recovered. Kudos on the fully detailed report on this expedition. Makes me long to get to the bush again soon. Ken, I was wondering where you and your crew paddled this summer. Gull River was it? I feel your pain about that video camera! I am looking for a fairly inexpensive way of downloading the day’s files on a storage device so that I never again lose everything. Re: the detailed report. You should know that it was your detailed report on the 2009 Allanwater canoe trip that made me think I had to up the level of my trip reports more than a tad for them to be as useful as yours. I’m not quite there yet. This summer we made use of your Albany River maps and notes for the stretch from the mouth of the Misehkow River to Miminiska Lake. Thanks. Regrettably, my crew did not get out this year, schedules and life events just wouldn’t allow it. Hopeful to get out next year, and I have a couple of rivers marked as possibilities. I lost my camera a couple of years ago on the Gull. My only thought for downloading downloading, is to use multiple memory cards over the course of the trip (i.e. 2GB cards for each day or two). Ken, I checked the list of canoe trips on your web site shortly after replying and noticed that the Gull River trip was 2011. Your 2 gb card approach would seem to be the cheapest solution. I am also moving on to a shirt with two large chest pockets instead of the one small pocket with the side zipper that I was wearing. Re: river possibilities. We are doing the Bloodvein River in July of 2014. Getting to Red Lake from southern Ontario would add a half-day of driving to the 1 1/2 we do to get to Armstrong Station but the river sounds like a lot of fun – and it has numerous pictograph sites on top of all the other positives. We will probably see more canoe trippers than we have in Wabakimi country. I like your brother’s suggestion, up the creek again, but even better than that I recommend the route further east on the Albany up the Opichuan River from Abazotikichuan Lake(sp) to Kagagamianis Lake(sp) and then south … now that it’s finished. I’ve been on 9 trips working with the Wabakimi Project, and even with all the work I would love to do any of the routes over again. It’s all gorgeous country and mighty fine paddling. Ken, gotta agree with you about the “mighty fine paddling” that the Greater Wabakimi Area provides. I am just glad we “discovered” the possibilities. It was the Wabakimi Project website that opened the door for us back in 2010. We have returned every summer since then. I’ll have to google map your dream trip to see where it is. There is certainly no end of possible routes to be put together; it’s never too early to be planting the seeds of the next adventure! Thanks. This year’s crew had the easy job of transporting two canoes from the west end of Attwood Lake, to the east end of Guerin Lake via Hurst Lake, to situate them for the second set of work trips in August. Except for the 37C heat we had a great time. In the previous two years’ trips we did the Miminiska Lake via the Albany to Petuwa Creek route in 2011, and then from the west end of Triangular Lake via the Albany River to Abizotakichuan Lake and south to the Opichuan River about 2 km south of Opichuan Lake in 2012. Both of those were great trips. Anon, here it is October and you’ve got me dreaming canoe trips. I’m seeing names of lakes and rivers I have never heard of before – nothing like paddling them to make them come alive. As always, thanks to the Wabakimi Project crews for the work in recording and creating campsites and portages to make these trips easier. Saw your comment on myccr re: the chainsaw up on Petawa Creek. I’ve done 9 routes with Phil, and it’s the same with most of them. If there isn’t enough traffic I’m afraid that they will all revert to their former state. P.S. I was anon above. I’m wondering about the maps shown in your post. These do not appear to be the 1:50000 maps that one can download from the Atlas of Canada web site. I am planning a 2014 trip in S Woodland Caribou. I’d say the Topo Canada maps are a good investment. I got it here – http://www.gpscity.ca/garmin-topographic-canada-dvd-with-basecamp.html although I notice MEC also sells it. Where are you headed in WCPP? My bro and i are thinking of doing the Bloodvein from top to bottom in July – and then flying back from the end point to Red Lake. 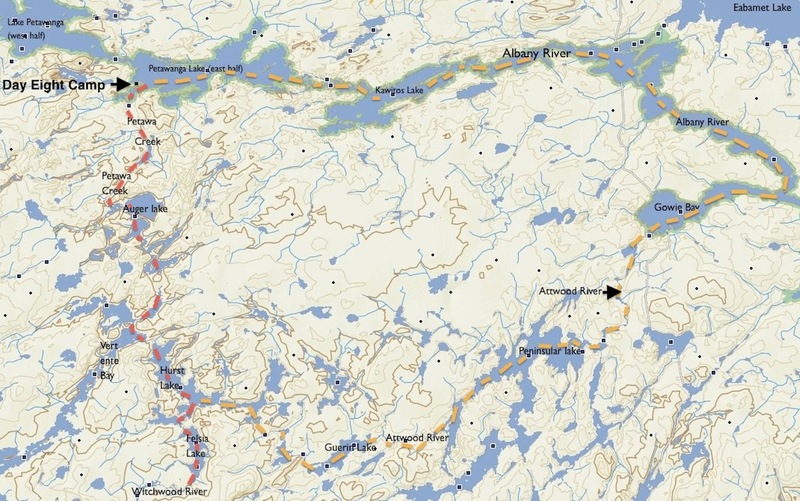 My current plan is as follows: Leano Lake, Kilburn, west to Talon Lake, Aegean, Welkin, Beamish, Irregular, Mather, Haggart, Bulging, then down the Haggart river to Carroll Lake for fly-out. It’s about 120 km, with ~33 portages. I’m trying to avoid outposts this time and I think this route has very few. Harlan says the one on Haggart hasn’t been used in years. Carroll Lake has some outposts. I will be recruiting my Wabakimi 2012 crew (including my bro) for the trip. I wanted to do it in 2013, but it didn’t work out, which may be for the best since so many of the portages were blocked by the big snow/blow-down of October 2012. I think many of the trails are now reopened. Will you be paddling the Bloodvein all the way to Lake Winnipeg? Looks like a fabulous trip. Jim, I’ve been in touch with Harlan too. In fact, I just received a copy of the WCPP map from him. I put it to good use and followed your route from lake to lake. Looks like it will keep you guys busy. Our route is simpler. 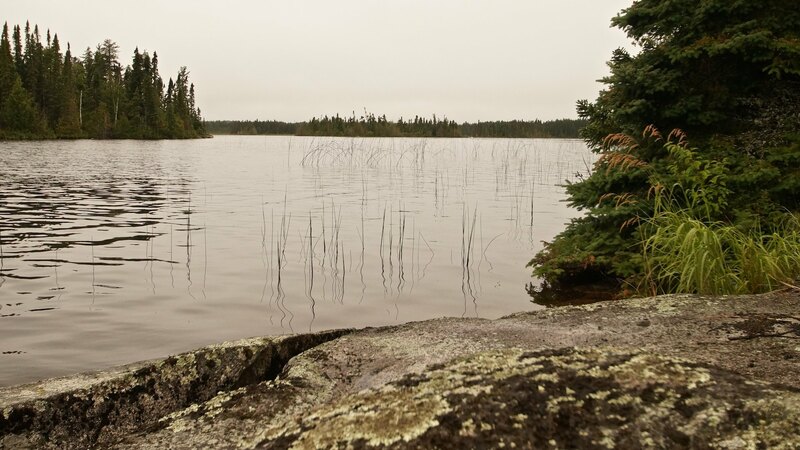 Get into the headwaters of the Bloodvein at Douglas Lake via Trout Bay after a boat shuttle with Harlan, then paddle to Indian House Lake and into Knox and Murdock and Larus Lakes and on down the Bloodvein to Lake Winnipeg! Like you we will use a float plane ride to get back to our vehicle at Red Lake. I am looking forward to the numerous pictograph locations on the Bloodvein River system and nearby spots that we will check out. Now all we have to do is wait for eight months! I did the Petawa creek with a group from YMCA Camp Menogyn in 2000. We have a fairly standard route that takes us down the Albany from Osnaburg, up Petawa Creek to the Witchwood and from there we make our way through the big lakes to the Kopka ending at Nipigon. I suspect a group from Menogyn does that route every couple of years. I remember a hard day of dragging boats over logs in deep woods up to my waist in the creek. Can’t wait to go back though! Chris, who knew! And here I thought it was a seldom travelled stretch of water and my bro and I were two of the very few who had ventured up. Your description of dragging canoes up the creek sounds very familiar! If Camp Menogyn creates trip reports of its wilderness canoe trips, I have never googled my way into one! It would make for interesting reading. 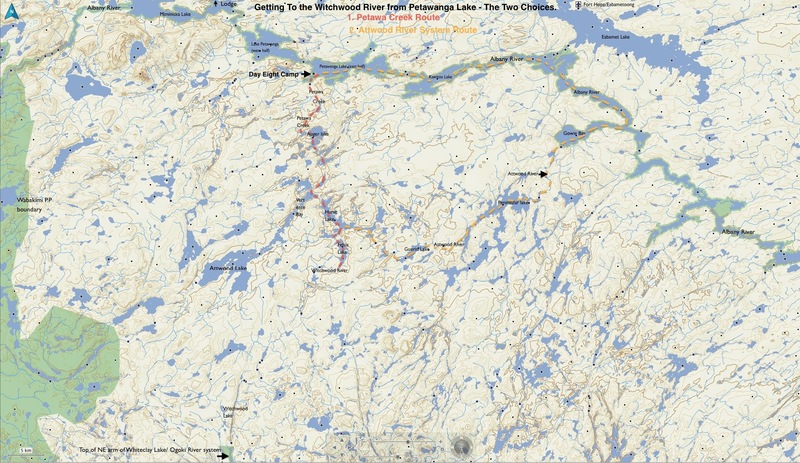 The route from Osnaburgh to Nipigon which you describe is a challenging one! How old are the teens that you take on this adventure and how long a trip is it? Thanks for taking the time to let me know of your group’s connection to Petawa Creek! Your comment – Can’t wait to go back though! – is something my brother also said a few months after our trip! I am on the fence about that one!